Brick, Tuckpointing…and the Polar Vortex? Is Tuckpointing or Brick Repair in Your Future? What a tremendous year of cold, snow, and ice! It is fair to say the winter of 2014 is one to forget. It’s only February, we are only half way there! The freeze and thaw of a typical year in St. Louis is brutal, this year is exponentially worse, and I’m not reflecting about the morning walk to your car. St. Louis weather’s propensity for being highly irregular wreaks havoc on your masonry walls. Masonry units, i.e. bricks, block, and stone, have varying degrees of porosity and when they freeze the moisture they are retaining freezes. In St. Louis, of course, one might have a parka on one day and shorts the next! This constant freeze and thaw is devastating to your brick home’s tuckpointing; this repetitive cool weather contractions and warm weather expansion eventually will cause your brick to crack or spall (it looks as though the “faces” peel off) or the mortar joints may begin to crack. If constructed or previously repaired properly, the mortar joints will fail first. Repointing, commonly nowadays referred to as tuckpointing, the mortar joints is a much less expensive process than replacing the brick or stone itself. 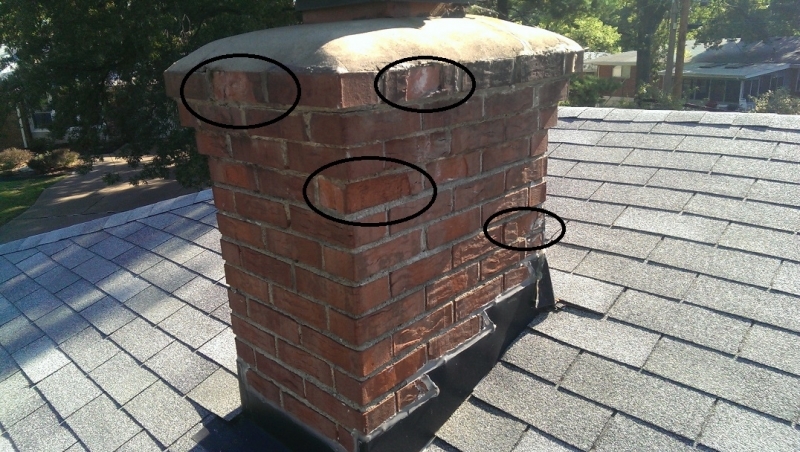 The following photo illustrates a chimney with the aforementioned spalled and damaged brick. Notice how the “faces” seem to have peeled off and now needs brick repair. The depth of water retention and freeze results in the depth of spalling of the brick. Although this freeze and thaw is especially hard on chimneys, it abuses parapets, walls, and all other masonry structures as well. The deterioration and crack patterns on walls are dependent on a variety of structural issues such as the wall configuration and number and locations of openings. If your walls, chimney, or parapets have not been addressed in a few years, or the chimney and crown inspected, this spring would be a good time to have a professional St. Louis tuckpointing and masonry company inspect it. By Spring, the freeze cycles are ending, and inspection, diagnoses, and repairs can safely begin. Spring is an optimal time to evaluate and address these issues. We offer no obligation, free inspections and estimates. Contact us today!